Today, we are really glad to wish Rajnikanth, the legendary Superstar of Tamil cinema. Born as Shivaji Gaikwad, today He is the richest movie star in India and the second richest (only after Jackie Chan) in Asia. The glory and greatness of Rajni Sir cannot be shared in words. Once in Chennai, He was teaching his grandson, how to use a gun. His grandson was carrying a toy gun. The child shot a toy bullet and missed the target. The bullet hit Osama in Abbotabad (Pakistan) and Osama died. Once He went to Mars. That is why there is no life there. We should not worry about the world ending on 21 December 2012 because He is there to save us. Once He acted in the Tamil Remake of “Ghulam” (1998 Bollywood movie). Rajni was playing Aamir Khan‘s role. In the scene he was running towards the train, train jumped and went to the other track. Rajni‘s next movie – A Tamil remake of Titanic. Climax revised! In the end, Rajni swims towards the sea-shore with heroine in one hand, Titanic in the other. Today Social Champs is starting a campaign to wish Rajni Sir, a very Happy Birthday. Send your birthday greetings and tell us what do you wish Rajni Sir to do. 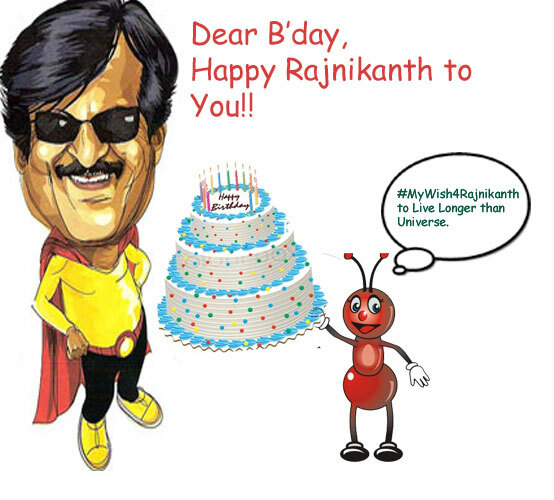 Send your greetings and wishes with a hash tag #MyWish4Rajnikanth. So what do you wish Rajnikanth to do? 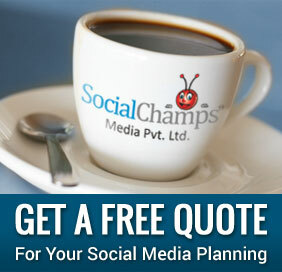 Tell us as a tweet with #MyWish4rajniKanth and you may get a chance to be featured on Social Champs blog. wish you a very happy birthday Mr. rajnikant. I wish Rajni Sir does something about the extreme levels of idiocy in our country. Siva ji the Bôss, The super star Rajni sir. Yöu are the real boss of film industry as well as our hearts. Wishng you a very Happy Birthday my BOSS ! Heard in Tamil version of Lagaan Rajni Sir was batting with last ball remaining and seventeen runs to be made. He adjusted the goggles and flicked his hair-lock to tell the bowler to ball.The ball came and he hit it so hard t at it broke in three parts with all pieces flying in different directions, beyond boundary for six runs each, totalling eighteen runs. He won the match. For celebrations he took his team to McDonnells and demanded Idlis.The brave owner dared to tell NO to him.Since that day you always see him sitting outside. Rajni Sir Rocks!!! Happy Bday Rajni sir…Today is : 12/12/12 LAST Same Date Nd Rajnikant Birthday !! ur all movies are awsm. Who are the heroes of India? Amitabh Bachchan, Sachin Tendulkar, Dhoni, Salman Khan, Shah Rukh Khan and Anna. You wonder why Rajniknath is not in the list. Actually he is not a hero, he is a super-hero. Some people get lucky and kill two birds with one stone. Rajnikanth once killed four birds with half a stone. What? You say there’s no such thing as half a stone? Well, the four dead birds didn’t think so either.